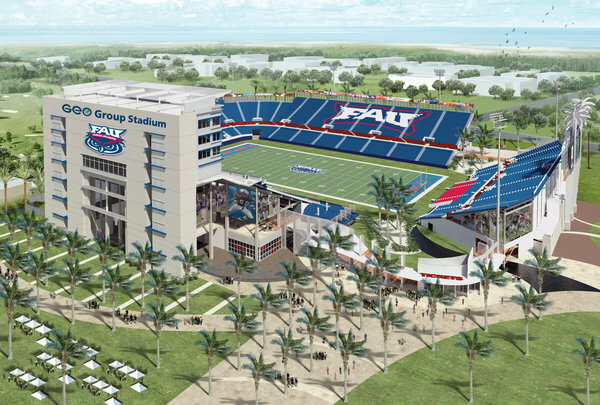 An artist’s rendering of the Florida Atlantic football stadium, renamed for the GEO Group. In recent years, where stadium naming rights could be sold, universities and professional sports teams have sold them — to airlines and banks and companies that sell beer, soda, doughnuts, cars, telecommunications, razors and baseball bats. This led to memorable examples like Enron Field, the KFC Yum! Center and the University of Phoenix Stadium. On Tuesday, that trend took another strange turn when Florida Atlantic University, in Boca Raton, firmed a deal to rename its football building GEO Group Stadium. Perhaps that pushed stadium naming to its zenith, if only because the GEO Group is a private prison corporation. For this partnership, there is no obvious precedent. The university’s president described the deal as “wonderful” and the company as “well run” and by a notable alumnus. But it also left some unsettled, including those who study the business of sports and track the privatization of the prison industry. To those critics, this was a jarring case of the lengths colleges and teams will go to produce revenue, of the way that everything seems to be for sale now in sports — and to anyone with enough cash. The stadium, which opened in the fall of 2011, cost $70 million and seats more than 29,000. It offers 6,000 premium seats, 24 suites and 26 loge boxes. In a telephone interview, the university’s president, Mary Jane Saunders, noted that GEO’s chairman, George Zoley, had two degrees from Florida Atlantic and once served as chairman of the Board of Trustees. Four members of the board, Saunders added, have also worked for the GEO Group, including two past student government presidents. The company’s corporate headquarters overlook the stadium. Saunders said the GEO Group emerged as the “strongest prospect” for a naming rights partner, and at an important time, as Florida Atlantic moves from the Sun Belt Conference into Conference USA next season. Critics say the cost may be too high. One is Bob Libal, the executive director of Grassroots Leadership, a social justice group that opposes private prison systems. Libal said the GEO Group “poured enormous resources” in recent years into “attempting to take over a large portion of the Florida prison system.” He said the company’s usual practices included lobbying and charitable donations, often in areas where it operated facilities or planned to. To that end, this move could represent a way for the company to rebrand itself in Florida, he added. GEO Group reported revenues in excess of $1.6 billion in 2011, income generated mostly from state and federal prisons and detention centers for illegal immigrants. The company owns or runs more than 100 properties that operate more than 73,000 beds in sites across the world. It holds nearly $3 billion in assets. The company has been opposed by civil liberty and human rights groups and immigrant rights organizations. It has been cited by state and federal regulators and lost a series of high-profile lawsuits. An N.C.A.A. spokeswoman said individual universities made decisions regarding naming rights, with no N.C.A.A. involvement. Swangard, at the University of Oregon, said he told his students that “sponsorship begins and ends with objectives” and “sponsorship is not philanthropy.” He said universities should draw the line where they can defend the natural association that comes with the company they do business with. As are the financial requirements of big-time college sports. To that end, said David Ridpath, a professor of sports administration at Ohio University and a member of the Drake Group, a network of professors who lobby for academic integrity in college sports, those constraints must also be considered.